At Tampa Bay Rescreens and Repair, we use only the best materials in our Pool Enclosure paining service. The Direct-to-Metal (DTM) product line of paints by Sherwin Williams has many benefits that make it stand out among their competitors lower-quality paints. DTM ACRYLIC FINISHING is a 100 % acrylic, water reducible, corrosion resistant finishing for light to moderate industrial use. Developed for new building or maintenance usage and can be made use of straight over prepared substrates. It turns out to be perfect for pool enclosure painting and can easily accompany a rescreening of your pool enclosure. Painting your pool enclosure is a cost-effective alternative to rebuilding it from the ground up. You could save thousands of dollars and still restore your pool enclosure to its original luster by painting it using our Direct-to-metal paints. Not only is it cost-effective but also environmentally friendly, as you will be recycling your old enclosure to last for years to come. Tampa homeowners who are trying to pinch a penny will be making a sound choice with this alternative and Tampa Bay Rescreens and Repair will do their very best to make sure you get quality service at a fair price. We use Sherwin Williams Direct-to-Metal paint for your pool enclosure to help your pool cage resist the elements. Please schedule an appointment with Tampa Bay Rescreens & Repair services Tampa, St. Petersburg, Clearwater, Dunedin, and Oldsmar areas. Please call us today at 813-679-1074 or you can also contact us using the button below. SunTex exterior shading fabric is made of strong vinyl-coated polyester. Developed originally for use in outdoor furniture, SunTex is mildew and fade resistant and needs only an occasional cleaning with mild soap and water. Ideal for use as a shading fabric on windows, doors and porches, SunTex is also pet resistant. The traditional choice for patio and pool enclosures. Designed for applications where extra strength is desired. Known as No-See-Um screen, this fiberglass screen is a tightly woven 20×20 mesh designed to keep out smaller flying insects. While densely woven, this screen still allows good ventilation and visibility and provides some daytime privacy. Phifer’s fiberglass screening is woven from permanent glass yarn which has been coated with a protective vinyl to ensure lasting beauty, color and flexibility. It is produced under the most exacting conditions to meet extremely rigid specifications. Fiberglass screen is noncombustible and will not rust, corrode or stain. We use Phifer screen quality materials to extend the life of your pool enclosure, please schedule an appointment with Tampa Bay Rescreens & Repair services Tampa, St. Petersburg, Clearwater, Dunedin, and Oldsmar areas. Please call us today at 813-679-1074 or you can also contact us using the button below. Your investment of building that pool, lanai, or deck may have cost you a pretty penny when it was originally constructed. At Tampa Bay Rescreens & Repair, we want to help you protect your investment by making sure the pool enclosure is kept up and that it can protect your property from the elements. Over the years, the elements can take their toll on the metal and a simple rescreen won’t be enough. Structural integrity is just as important, if not more than the appearance of your pool enclosure. There are many things that are involved to help keep your enclosure from falling down and perhaps becoming damaged beyond repair. Sealing the carrier beam or header properly will prevent water from getting behind and rotting your fascia board. In the examples above, mounting the carrier beam to an actual structural portion of the house (e.g. wall joists or roof trusses) is a much better choice. Only fastening the pool enclosure carrier beam to the fascia board or exterior sheathing is not enough which could end in catastrophic failure. Using lateral wall bracing cables are important to keep the front and side walls from moving, as the old eyebolt type drilled through the frame is not as effective as the newer angled wall plates. These wall plates actually attach to the top and upright portion of the aluminum framing and come with an adjustable stainless steel eyebolt and nuts so you can tighten the cable over time as they become loose. The older eyebolt through through the frame is useless unless it has a turnbuckle, as they cannot be tightened over time and if they do, they will have more than likely rusted so much that the buckle cannot be turned. The wall anchors that hold the entire cage to the concrete slab are another important structural aspect to the safety of your enclosure over time, since the chlorine from your pool will corrode the ceramic coated tapcon used to hold it down. The tapcons should be replaced about every five years. Stainless steel anchors are also available and will last much longer, but will eventually corrode to due the corrosive properties of chlorine. If your pool enclosure is beginning to fall and you need to increase its structural integrity, please schedule an appointment with Tampa Bay Rescreens & Repair services Tampa, St. Petersburg, Clearwater, Dunedin, and Oldsmar areas. Please call us today at 813-679-1074 or you can also contact us using the button below. Normally, pool enclosures are either white or bronze. As a pool enclosure ages and is exposed to the elements like sun and rain, the metal can oxidize and create rust or rust streaks on the pool cage in addition to the screws. White pool enclosures will become chalky and leave behind a residue that denotes oxidation of the metal underneath. Even the bronze pool enclosures will show some signs of rust and wear, so painting the enclosure can protect it and restore it to its previous luster. Pool enclosures will typically last 10-12 years at which time you might consider replacing the pool enclosure or, at the very least, replacing the screen materials. If you’re already going to have your pool enclosure rescreened, Tampa Bay Rescreens & Repair can protect your investment by painting the enclosure, which might also make it more appealing by matching the color to the surrounding environment or the home exterior. You can choose from these colors: white, blue, grey, black, brown (earth tones). You can easily spend between $6000 and $10,000 on a new pool enclosure, but now there is a more cost-effective option to have the pool enclosure painted. The costs associated with pool enclosure painting is between $1500 to $2000, which means you will be accomplishing the same goal by protecting and beautifying your home at a fraction of the cost. Protect your pool enclosure and make it more beautiful with pool enclosure painting services. Tampa Bay Rescreens & Repair services Tampa, St. Petersburg, Clearwater, Dunedin, and Oldsmar areas. Please call us today at 813-679-1074 or you can also contact us using the button below. Tampa gets a lot of rain, especially during the Summer months, so you want to make sure that your gutters are effective in order to keep your roof in good condition. If your home is in an area with tall trees, keeping your gutters clean can be a chore. Tampa Bay Rescreens & Repair specializes in the installation of gutter guards, which do just that. Leaf Smart is a steel mesh screen that prevents leaves and debris from clogging your gutters. It’s ideal for both new and older homes and can be installed in minutes. With Leaf Smart your gutters can do their job protecting your home. Leaf Relief for standard gutters is more effective than other types of gutter protection at keeping natural debris; such as leaves and twigs, from blocking your gutters. Leaf Relief can drain 29.7″ of rainfall an hour-that’s more than the highest rainfall ever recorded (Holt, Missouri 1947 at 12″) in one hour. Leaf Relief is not only the most effective gutter protection system on the market, it is also the most invisible. 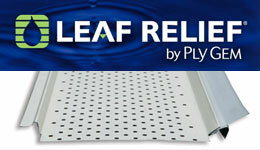 Leaf Relief® lays flatand fits snugly on top of your gutter. Leaf Relief’s 25 Year Warranty is your peace of mind that it will keep gutters from overflowing due to internal gutter clogging. Leaf Logic attaches at front and back for a secure fit. There’s no need to lift shingles or disturb roofing and risk voiding your roof warranty. Fits standard gutters on both new and older homes. Made of heavy-duty aluminum, Leaf Logic won’t rust even after years of service. Backed by a 20 year Warranty. The patented design of the Bulldog Gutter Guard system filters rainwater into the gutter system while leaves and debris are blown away. The gutter system is now a free-flowing roof drainage system working at full capacity, saving you the danger and hassle of cleaning gutters, while saving you thousands of dollars in damage each year. The Bulldog Gutter Guard system is an aluminum insert, designed and cut to fit snugly into your gutter. Even during the heaviest of rainstorms, the water flows through the guard into the gutter and out the downspout. Our unique design is virtually invisible from the ground. If you would like to extend the life of your gutter system, contact Tampa Bay Rescreens & Repair to get an estimate for their installation. Tampa Bay Rescreens & Repair services Tampa, St. Petersburg, Clearwater, Dunedin, and Oldsmar areas. Please call us today at 813-679-1074 or you can also contact us using the button below. At Tampa Bay Rescreens and Repair, we pride ourselves in keeping you comfortable in your own home by protecting you from the outside elements, including pesky insects that could encroach on your living space. Using high-quality rescreening materials like Super Screen ®, our finished product is second-to-none in the Tampa Bay Area. Here’s a short list of the types of insects that our pool cages, screened-in porches, and lanais can keep out. Probably the biggest insect problem that people complain about in Tampa Florida is the mosquito. In Florida, mosquitoes could possibly carry illness, and cause uncomfortable bites and so avoiding mosquitoes is a big advantage of an insect screen. You can spend a lot of money on chemical repellents, tiki torches, and smelly citronella candles, but a screen installed by Tampa Bay Rescreens and Repair could save you from having to come out of pocket for a short-term solution. Spiders, while they serve to keep some other parts of the insect population under control, are not something people want roaming around their pool or porch. Their bites, depending on the spider, can make you extremely sick or even cause death. At Tampa Bay Rescreens and Repair, we want to make sure you and your family (pets included) are protected from spiders. So if your spiders aren’t doing their job and helping keep the fly population down, our screens can give you an extra layer of protection. As well as being a nuisance, common flies can present a health danger if they enter contact with food. Keeping out flies is perhaps the most common reason to set up a screen, and all of our screens will obstruct entry from flies. Bees and wasps are among the most feared intruders into Tampa Florida homes, since their sting is typically the most painful of all the insects we’ve talked about. The pool cage material we provide can keep out these types of insects and keep your family safe from others in this class such as hornets, mud daubers, and yellow-jackets. A “no-seeum” biting midge compared to the size of a U.S. penny. Colloquially referred to as “no-seeums”, the biting midge is a tiny insect. As you might guess, they are so small that you can hardly see them, which is where we get the term. As a result of their size, midges have the ability to enter through considerably smaller sized areas than most of other pests, and therefore need a finer mesh. Screens provided by other companies may not stop the entry of midges. In numerous parts of the country, midges are not a problem and so this is not needed, but in Tampa Florida, they can be a great nuisance. There are over 4,000 species of biting midges in the Ceratopogonidae family, and over 1,000 in just one genus, Culicoides. If you would like to keep insects out of your pool area, porch, or lanai, ask our experienced team about our materials. 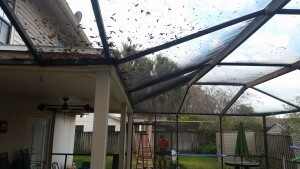 Tampa Bay Rescreens & Repair services Tampa, St. Petersburg, Clearwater, Dunedin, and Oldsmar areas and can install a new screen for you using top-quality Super Screen ® material that can keep all kinds of insects out. Please call us today at 813-679-1074 or you can also contact us using the button below. If you are in need of a rescreened pool cage, lanai, or porch, call the guys at Tampa Bay Rescreens and Repair. They use top-quality material in every rescreen job, since your job is important to us and we want you to have the best experience possible. Take a look at these features of Super Screen ® that make it our choice for rescreen jobs. The newest technology available in screen defense for swimming pool, patio area or porch. Super Screen ® is the perfect option for the property owner who requires the very best in family pleasure and safety outdoors while offering a high-quality, lasting home enhancement investment. Unlike fiberglass evaluate that ends up being hard and breakable after a couple of years of direct exposure to sunlight, Super Screen ® retains versatility every year. After a 7 year weathering test, Super Screen ® lost just 1 % of its tensile strength. This alone is fantastic! The great mesh of Super Screen ® transcends in safeguarding against bugs and bugs while maintaining transparency. Breezes blow through. All else stays out! The UV tolerant homes protected by Super Screen ® reveal themselves through unparalleled color retention, durability, and filtering characteristics. With Super Screen ®, extended direct exposure to the sun will not result in the bleaching, flaking, and fading, like other screens– this means that it will certainly keep its like-new appearance and save you money on maintenance for it. Repair works to screen doors, patios, pool cages and porch screens are commonly a continuous expenditure to animal owners. Super Screen ® eliminates this expense. Clients say that they can not even see claw marks. Prior to Super Screen ® being offered in the rescreening marketplace, outdoor screen products just offered consumers protection from bugs and bugs– no defense versus punctures, tears or regular deterioration. Super Screen ® offers far more, especially for the folks who live in Florida during an active hurricane season! Wind blown particles and falling items simply bounce off the screen. Super Screen ® is a miracle of space age technology developing lightweight yet incredibly strong fiber hairs. These hairs are then woven into a screen mesh that is virtually unbreakable. Super Screen ® material consists of a biocide compound that withstands mildew development, yielding longer long lasting appeal from the material. No other swimming pool screen, porch screen or patio area screen can claim this. The quality of Super Screen ® material is backed by a 10-year warranty that makes it the only choice for Tampa Bay Rescreens & Repair. If you have a pool cage, patio, or lanai that needs a rescreen, Tampa Bay Rescreens & Repair services Tampa, St. Petersburg, Clearwater, Dunedin, and Oldsmar areas and can install a new screen for you using top-quality Super Screen ® material. Please call them today at 813-679-1074 or you can also contact them using the button below. Are you tired of seeing your dirty pan roof? All over Florida, there are tens of thousands of pool cages, lanais, and screened-in patios that serve to protect residents from the elements such as rain, wind, and sunlight. Over time, the wear and tear on those roofs can cause them to become an eyesore and they inevitably lose some of there effectiveness in keeping the temperature down in the summertime. Tampa Bay Rescreens & Repair specializes in rescreening these types of enclosures, and wants to make sure that you’re able to survive the annual Florida heat wave and high UV index. If your residence isn’t protected by surrounding foliage, then your screened-in patio or pool cage will probably receive direct sunlight for most of the day. The blistering sunlight can be damaging to both the metal of your pool cage as well as the wooden or cement foundation by causing it to expand and contract as the temperature rises and falls. With an insulated pan roof, not only is your pool area protected from harmful sunlight, but you will be able to enjoy a dip in the pool or a reading a good book in your patio chair without having to endure such high temperatures and skin-damaging UV rays. 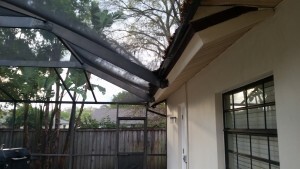 Tampa Bay Rescreens & Repair can install of replace an insulated pan roof for your pool cage or patio, which can reduce the temperature by 15 to 20 degrees. Insulated roof panels help the roof from radiating heat into your screen room using a special foam material that absorbs the heat from sunlight and keeps it out of your pool cage or patio. Pan Roofs look great, too! Not only does an insulated pan roof protect you and your family from the elements, but they also give your pool cage or patio an aesthetically-pleasing look. Having this kind of addition to your home may also increase its value and will definitely make your pool look like an attractive hang out spot in the Spring and Summer months. You and your family can enjoy the Florida summers without burning up and keeping your pool looking great! Tampa Bay Rescreens & Repair installs insulated Pan Roofs that are built to last. We use only the highest quality materials and will make sure that you are completely satisfied with our installed product and the quality of our work. To insure that your pan roof lasts as long as it can, we install special metal end caps that keep the foam from deteriorating from the ends. Out motto is “quality work at a fair price”, which we stand by with pride. If you have a pool cage, patio, or lanai that sits in direct sunlight and you want to survive the summer heat while you hang outside, Tampa Bay Rescreens & Repair services Tampa, St. Petersburg, Clearwater, Dunedin, and Oldsmar areas and can install an insulated pan roof in just a few hours. Please call them today at 813-679-1074 or you can also contact them using the button below.